Thinstuff FAQ's | Support Topics - How can I sign my .rdp files? You can use a digital signature to sign .rdp files. When you sign rdp files with trusted certificates, your clients can verify that important settings such as which server to connect to haven’t changed since the creation of the rdp file. This enables clients to recognize your organization as the source of the RemoteApp program or the remote desktop connection, and allows them to make more informed trust decisions about whether to start the connection. So what do you have to do to sign a .rdp file? A .rdp file is a basically a simple file ( filled with parameters) that defines the connection settings for a Remote Desktop or RemoteApp session. You can easily edit, copy and distribute it. Basically you can create a .rdp by using the notepad and add the standard parameters. However, for this you'll have to know all the parameters. The simplest way to do this is to run TSX Connection (tstsc.exe), configure your basic settings and save it. You can also use Microsoft's Remote Desktop Client (mstsc.exe). 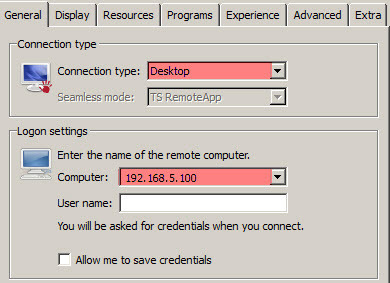 Thinstuff has developed TSX Connection to make a Remote Connection client that allows you to configure,change and save Remote Desktop connections as well as RemoteApp connections. Microsoft's Remote Desktop Client offers no possibility to configure or activate RemoteApp connections. You can download TSX Connection from here. In the download also included is the TSX Connection Manager - With this tool you can manage all your Remote Desktop, RemoteApp Connections in a graphical user interface and export, import them easily. After the download please install the package and launch TSX Connection. Now customize all required fields to your needs. Now save your .rdp file. Please remember the path where you've saved it! The next step is to import your certificate and get your certificate's thumbprint. This step requires a valid .pfx certificate (either self-signed or CA-signed) and the export password from the .pfx file. Now select "Certificates" and click on "Add"
Choose "My user account" to manage your personal certificates. After that click on "finish"
Now click on 'Browse' and choose 'Personal Information Exchange .pfx, .p12' as file type. Click on 'Finsih' to complete the import process. After you've created your .rdp file and copied the certificate's thumbprint(without blank spaces) you can sign your .rdp file. All rdp file(s) have been succesfully signed.